Even though it is likely that most mainstream editors and publishers will forbid any of their journalists to write about this very important, well-documented issue (which endangers the health of the world’s humans), I nevertheless submit it to a select list of journalists. Please study it carefully (and ethically). It is surely NEWS THAT’S FIT TO PRINT (except perhaps for Big Media outlets like the NY Times, it appears). It is important to note that none of the NY Times editorial board members are either physicians or scientists. Therefore, none of them could have had any expertise in the true (non-corporate-influenced) science or true (non-corporate-influenced) history of vaccinology. The board member’s opinions therefore are similar to what the heavily-propagandized public has repeatedly heard from 1) Big Pharma; 2) Big Pharma’s wholly-owned subsidiaries, the CDC and the FDA; 3) Big Media (whose biased corporate advertisers are largely uber-wealthy pharmaceutical companies); 4) Big Pharma’s shareholders (who are benefitting from the vaccine industry’s soaring stock prices and dividends); and 5) Big Medicine (whose physicians and increasingly monopolistic clinics and hospitals profit enormously from more and more known-to-be-neurotoxic infant vaccines – which are now so numerous that they have to be injected into the tiny muscles of tiny infants in cocktail combinations that have never been tested for safety even in guinea pig labs!). One type of mind control involves defeating logic as a method of thinking. Modern formulations of basic logic begin with the statement: You can’t have A and not-A. Which is a way of saying contradictions are unacceptable. So it’s no surprise that mind control attempts to introduce contradictions into rational processes. You see this in propaganda. But if the vaccinated person is protected and immune, then coming into contact with an unvaccinated person will bring no danger. 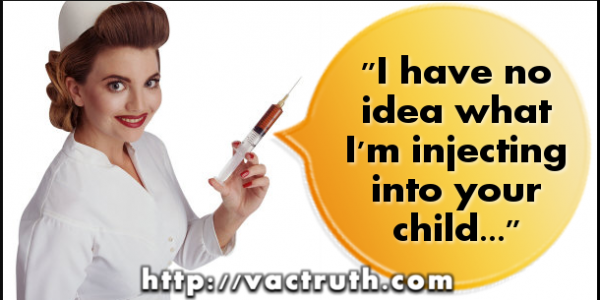 The Truth About Vaccines – Episode 1 goes live tonight!! Subject: The Truth About Vaccines – Episode 1 goes live tonight!! Hello and best wishes for health and freedom, both of which are impacted by the substance of this message. There is something in these vaccines that is going to adversely affect the global population. There is something they are trying to do via the vaccines. You cannot look at the current state of medical/science/pharmacology and seriously conclude that our health is the focus. We have never been in more danger from corporate non-scientific, experimental programs than we are at this time. I have concluded…….they really DO what us dead. Has the CDC lost its collective mind? In what most likely has to be one of the most convoluted, twisted up, insane things to have come along in quite some time, the Centers for Disease Control (Contamination) have come up with what has to be one of the all-time idiotic rationales concerning vaccines. This collection of mad scientists, government hacks, and NWO puppets has just published one of the most idiotic, screwed up explanations for why their “one size fits all vaccine even if it kills ya” is backfiring in a major way. The polio vaccine that Bill Gates, an admitted population reduction advocate, has been funding in the forced vaccination of every one in third world countries, is killing some and paralyzing many, many more as the polio virus mutates in response to the vaccine. This has created a far more virulent and aggressive strain of polio. India is a prime target. Currently, an estimated 50,000 have succumbed to vaccine induced polio paralysis which as it turns out is far more virulent than the strain they claimed the vaccine would prevent. Not to be deterred by anything that might resemble a precautionary truth, the CDC has decided that the reason the vaccine induced, virulent, mutated, strain of polio is sweeping India is NOT so much from the new strain being easily transmitted by those infected, or that the new strain is appearing only in those who got that magic polio vaccine, its because there are still unvaccinated children who are causing the disease to spread. Yeah…that’s it. Only they don’t have it. In the magical, mystical world of the CDC, anything can be explained away simply by choosing to refuse to acknowledge the reality of a situation and instead, creating an implausible excuse for why this mutation is spreading. According to the CDC, it is the fault of the UNvaccinated. People who never received the vaccine are causing a viral mutation from the vaccine that they never got, and they are still to be blamed for spreading a disease they never had. Those who were vaccinated for polio can also contract the new mutated polio virus if they don’t in fact, incubate the mutation.